Instructions: Fill out the application form (either electronically or print and write legibly in blue or black ink). Applications must be filled out and signed by either the property owner or the property owner’s legal representative. Renters are not eligible to apply. In which community is the property located? Are you the property owner or a legal representative? If a legal representative, is the property owner(s) aware of this application? For single family applicants: are you a year-round or part-time resident? For duplex applicants: do you have a party-wall agreement? Note: In order to be eligible, all duplex parties must individually apply for and be accepted into the program. Both property owners (or the authorized representative) must be present at the same time for both the assessment and the inspection. For multi-family applicants: how many units are there? Note: In order to determine eligibility for multi-family applicants, we will call you to further discuss the number of units and the property management structure. Are you willing to create defensible space as required by your Home Partners wildfire mitigation specialist (assessor) and based on the FireSmart Canada guidelines? Do you commit to implementing and maintaining mitigation measures for this property (for the length of your legal responsibility or ownership)? Note: Property Owners who join the Home Partners program may be asked to complete defensible space work and fire resistant construction retrofits to their home in order to qualify for a Home Partners certificate. These mitigation actions are strictly voluntary, but may be required in order to earn a program certificate. Property Owners must seek and attain all required permits and/or HOA/Strata approval before removing trees from their property and/or initiating new construction or alterations to their homes. Preparing for wildfires is an ongoing, long-term effort that requires maintenance and upkeep and does not guarantee home survival. More information on FireSmart Canada guidelines are available at: www.firesmartcanada.ca. Do you agree to participate in the on-site assessment? Note: Property owners who join the Home Partners program actively participate in an on-site assessment with a Wildfire Mitigation Specialist. This professional assessment—estimated to take two to four hours to complete—will identify the strengths and weak links in a property’s defenses and recommend actions to take in order to reduce wildfire risk. RIGHT OF ENTRY: I certify that I am the owner or the owner’s authorized agent of the above described property, and that I have the legal authority to enter into this Agreement. I grant freely and without coercion the right of access and entry to my property to FireSmart Canada, its agents, partner agencies and authorized Contractors at a mutually agreed upon date and time to assess my property for the risk of wildfire damage, to develop a customized wildfire mitigation report designed to reduce the risk of wildfire damage, to mark vegetation for removal with paint and to make follow up visits to my property to make sure I am fully prepared for future wildfires. RELEASE AND HOLD HARMLESS: I understand that this Agreement/Permit is not an obligation upon FireSmart Home Partners to perform any work my property. I hereby release, waive, discharge and hold harmless FireSmart, Partners in Protection Association, and the participating Partners in Protection Association member(s), its elected and appointed officials, and its employees, agents and representatives, and Wildfire Mitigation Specialists from all claims, liabilities, damages, losses, or expenses on account of damage to property, bodily injury, or death resulting from my participation in the FireSmart Home Partners program. By participating in the FireSmart Home Partners program and by executing this agreement, it is my express intention and I hereby waive any and all claims which I might have to bring in any form, whether legal or equitable, arising out of my participation in the FireSmart Home Partners program and any incidence relating to, but not limited to, the performance of Assessment, Inspection and Educational Work by any released party herein. DISCLOSURE OF PROPERTY OWNER INFORMATION: I understand that FireSmart Home Partners will collect data regarding my property in order to prepare a customized fire mitigation plan and may publish countywide maps of certified FireSmart Home Partners Program homes (names and addresses will not be included on maps). With the exception of specific provincial government or local government or First Nations government responsible for performing these assessments, FireSmart Home Partners Program will not share this data with third parties without the expressed written consent of the property owner. FireSmart Home Partners Program will not disclosure to third parties, except as required by law, any personal information they may collect in connection with my participation in the program. FireSmart Home Partners Program will share program information with program funders as part of normal program reporting. I further acknowledge that FireSmart Home Partners Program will disclose the name, address and status of program participants to their local fire protection district. Additionally, I understand that if a participant in FireSmart Home Partners Program (including myself) wants to know which of his or her neighbours are also participating in the program in order to help coordinate wildfire mitigation efforts, FireSmart Home Partners Program will provide this information to those program participants. DISCLAIMER: I have read and understand the following Disclaimer: While the purpose of the FireSmart Home Partners Program Property Assessment is to reduce the risk of fire damage to your home or property, following the requirements in the Assessment report does not guarantee prevention of such damage. Wildfire mitigation work around your home can give firefighters the best chance to defend and protect your property from wildfires, and can also substantially increase your safety and reduce the risk to life and property. However, wildfire is unpredictable and can be impossible to stop or control, regardless of what mitigation efforts you have taken. 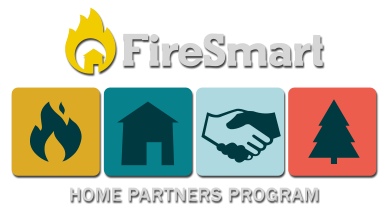 FireSmart Home Partners Program makes no warranties, guarantees or representations of any kind with respective to the effectiveness of any mitigation efforts you undertake in connection with your participation in the FireSmart Home Partners Program program. I/we (name of property owner(s) or legal representative as entered above ) agree to accept the terms as outlined in this application and the FireSmart Home Partners Program program liability waiver in order to be eligible for the program. I/we understand that we can withdraw from the program at any time through written notification submitted to the program coordinator. Withdrawal from the program will result in my/our ineligibility to receive a FireSmart Home Partners Program certificate.